Do you love books? 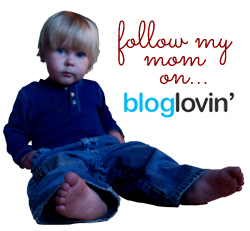 Do you love teaching your children about all sorts of subjects using “real” books instead of textbooks? Are unit studies your cup of tea? Then Moving Beyond the Page might be right up your alley! We recently received for review two of their unit studies in the 7-9 age range. The first was the Language Arts Package – The Whipping Boy, which included an online teacher guide and a physical copy of the novel. The second was the Science Package – Sound. This included a physical teacher guide and a life-size model of the human ear. Let’s dive into the literature package first. I remember having read The Whipping Boy as a child, and I thought my boys would enjoy it. They typically love books set in the middle ages. They love anything to do with “knights in shining armor times,” actually. Had we made this book a read-aloud like we normally do with our school literature, I’m convinced they would have loved this one too. But part of the focus of Moving Beyond the Page is building kids’ reading skills, not just “getting it done,” so I did the program the way it was designed and made the boys do their own reading. They weren’t thrilled with that, but it was good for them. Because the literature unit was an online guide, I didn’t have an actual book to teach from. But that was okay because the guide was mobile-device friendly, so I was able to use our Kindle Fire and wi-fi to get the job done. The online guide includes everything you need to teach the unit. You get the online teacher manual (this resource is completely online, not a downloadable PDF), a physical copy of the novel, and a 3-month license to print the downloadable student pages, all for $18.92. The teacher guide has comprehension questions and several different activities to choose from. These range from worksheets to discussion topics to doing research related to what was read and more. Normally I create the boys’ worksheets by hand (no printer at home), but this coincided with my tendinitis, so we ended up getting them printed this time. Execution of the program was very straightforward each day. The boys would read the book – sometimes together, but usually one would read and then the other. The chapters in The Whipping Boy are very short, so they were assigned three per day. We would go over the questions very briefly (more on that, and why we did them only briefly each day, later) and then do as many of the activities from the guide as worked for us. The boys’ favorite was when they got to design a crest (coat of arms) for each of the main characters. Most of the activities in the literature unit were worksheet-based, so I bought them each a folder (the kind with metal clasps in the middle) to hold all of their papers in. 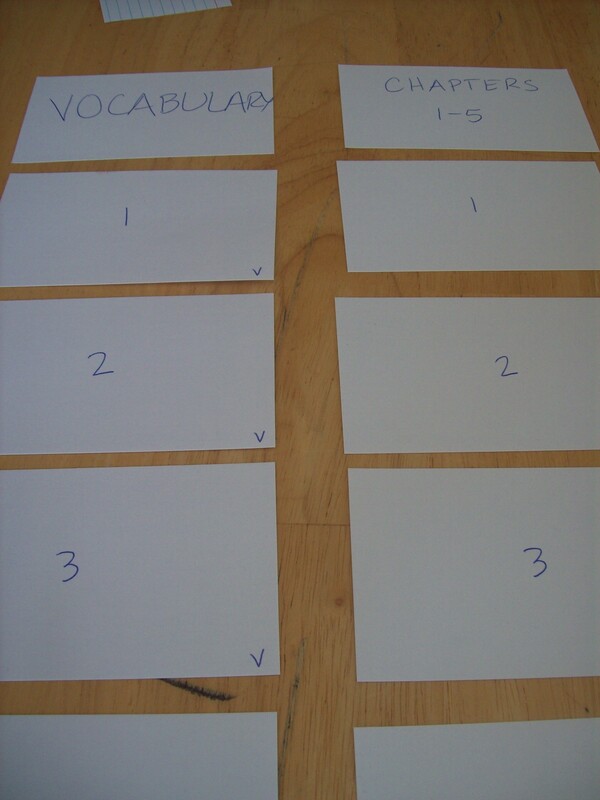 This worked really well for us; it’s a lot more budget-friendly and space-friendly than binders. Each unit in the Moving Beyond the Page curriculum package concludes with a final project. For The Whipping Boy, this was a monologue. The boys each planned out what they would say and then recited them for Will and me. They were instructed to include all the different kinds of speech patterns they’d learned about during the study in their monologue – idioms, similes, metaphors, and hyperboles. 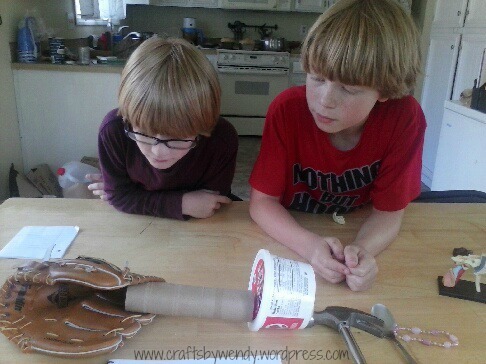 The baseball glove represents the outer ear, the toilet paper tube is our ear tube, the cottage cheese container is the eardrum, and the hammer, spoon, and bracelet are the bones deep down inside our ears. We used a marble to represent a sound wave, and the boys watched in fascination as the glove “caught” it and sent it through the tube where it hit the drum and caused the bones of the inner ear to vibrate. Another day we tested different sounds by tying a spoon to the center of a piece of yarn, and the ends of the yarn to the boys’ fingers. With the spoon hanging free and their fingers in their ears, I tapped the spoon with objects of varying hardness – another spoon, a plastic fork, and the skein of yarn. Then I had Seahawk tap the spoon for me so I could see what it was like. Let me tell you, it was fascinating! The sound was the same, but different, simultaneously. After we spent several days learning about our ears, we spent a few days learning about different sounds and how things make sounds. Then we learned all about different instruments, which led into the final project: designing an instrument. The boys were pretty basic with their instruments. 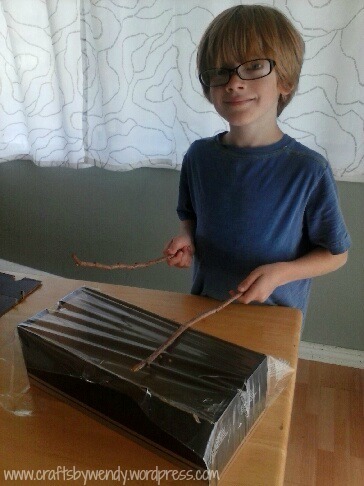 Munchkin made a drum using an old shoebox and some plastic wrap. Seahawk made a guitar using an old shoebox and some rubber bands (which apparently I didn’t get a picture of…). Overall, I think this was a pretty great curriculum resource. 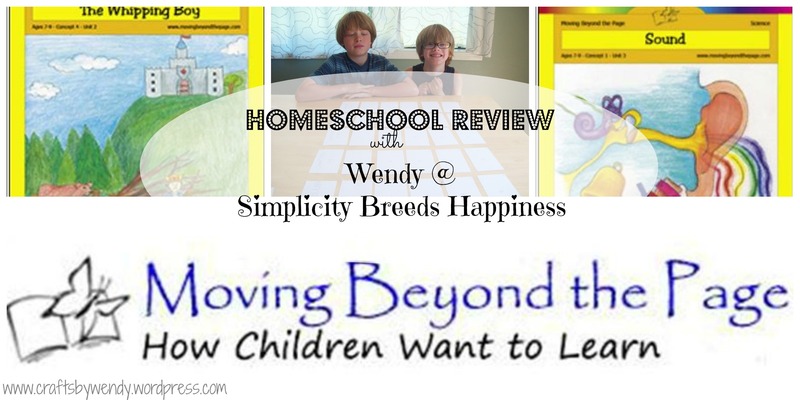 Moving Beyond the Page is designed to be a full homeschool curriculum – they have 12 literature units and six each science and social studies units per age level. Each literature unit corresponds with one science or social studies unit (I chose two that weren’t specifically designed to go together, but it worked well anyway), and they estimate that it should take you roughly 3-4 hours per day to get through it. I found that it didn’t take nearly that long. One and a half to two hours and we were done. Add a math curriculum (and any “electives” you want your kids to have) and you’re done with the basic education. It can get quite expensive to go that route, though – several hundred dollars for the full year curriculum. That can definitely be a problem for many homeschooling parents; I know it would be a huge deterrent for us. 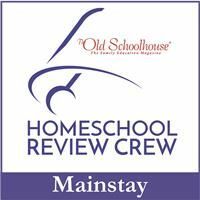 If price isn’t an object for you, I would definitely recommend that you investigate Moving Beyond the Page for your homeschool curriculum. If, however, you can’t afford the full-year package, I would still recommend taking a look at one or two of the individual unit studies to get your feet wet. I’ve listed the prices for the units I received in this review, and there are ways to make it even cheaper – pass on the physical book and get it from your library, for example. If you make the plunge into getting this curriculum (Moving Beyond the Page has packages for ages 4-14, not just the 7-9 I received, so there’s something for nearly everyone! ), the next step is deciding whether you want to get the physical guide or the online version. Both have their pros and cons. The main pro to the physical version is, of course, you don’t have to have a computer or mobile device right with you while you teach. The con is that you can’t make copies of the worksheets for your kids; you have to purchase a second copy of the consumables. The online copy allows you to make copies, but you lose your access after three months. The physical book is yours to keep. There are loads of other reviews for this program besides mine. Different members of the Crew got a variety of items for all different age groups. Make sure to click over and check them out! Have you ever used Moving Beyond the Page? Let me know in the comments!